2010 began as a warmer than average growing season with November nearly doubling average heat. After November, every month was slightly warmer than average except for the harvest month of March which was slightly cooler. The summer months of 2009/2010 recorded only 48% of normal rainfall and these combined warm temperature and low rainfall conditions set the stage for an early and fully ripe harvest of Tiers Chardonnay on the 11th of March. The hand-harvested fruit was delivered in perfect condition to the winery, which is situated at the foot of the Tiers Vineyard. Immediately on arrival at the winery the Tiers Chardonnay fruit was de-stemmed, crushed and chilled to 3ºC on the way to the air bag press. Cold juice was gravitated away from the skins through the press and only light pressings were added back. A small amount of SO2 was added to the juice on the way to the tank where the juice was allowed to settle for 4 days. SO2 was the only addition to the juice prior to fermentation. The clear juice was racked to new (50%) and 1 use (50%) oak barriques from the French forest of Vosges. A selected yeast strain, native to the vineyard, was added to initiate fermentation and the bacteria for the malo-lactic fermentation was added at the same time. The primary fermentation was complete in 6 weeks after which the yeast lees were stirred in the barriques weekly until the malo-lactic fermentation was complete 2 months later. At the finish of malo-lactic fermentation the wine was racked from barrique, SO2 was added and the wine was put back to barrique to sit on lees for a further 6 months. 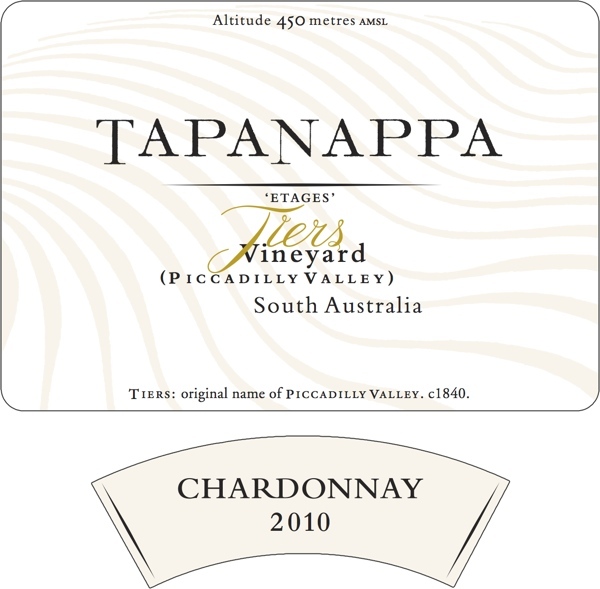 2010 Tapanappa Tiers Chardonnay is a very typical wine of the Tiers Vineyard from a warm vintage. The varietal aromas are ripe peach and melon. Subtle marzipan and brioche aromas and flavours are contributed by the malo-lactic, yeast lees contact and oak. A consistent terroir feature of Tiers Chardonnay is its very significant texture followed by a savoury finish and the persistence of the flavours. The 2010 Tapanappa Tiers Chardonnay will develop spicy honey and brulee characters with bottle age of up to 10 years. Bottled on the 18h of February 2011. Only 400 cases produced.